Raising Baby Bee: Baby Bee turns 4! I can't believe it. I refuse to believe it. This is.not.happening. My baby bee is growing up and is no longer a baby. I know, I know... she'll always be my baby, but seeing her open presents on her own and for the first time be aware of gifts and of the party made me so happy but so sad. Ok, enough of the sappy stuff - here's the good stuff. We set off Saturday morning to head to the Brevard Zoo which has been a tradition for Natalie. We first started going on her 2nd birthday and have gone every year since. This year, Christian, Anilyse and Grammy came with us! We love feeding this deer every time we go. She's so sweet! Of course we HAD to feed the giraffes! They had Christmas crafts set up around the park. Natalie got another stuffed giraffe from the zoo (which is also a tradition). 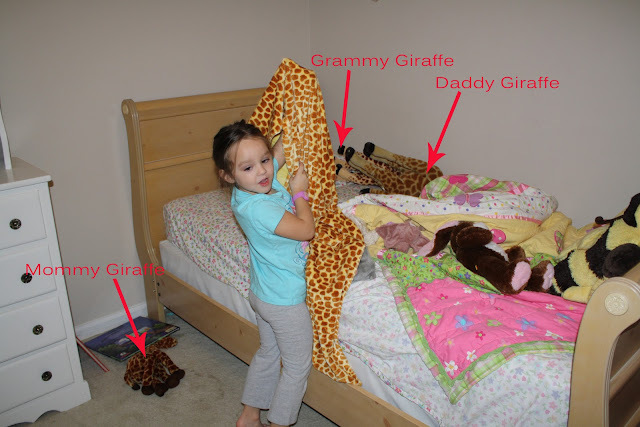 So, to date we have Daddy Giraffe (2nd birthday), Mommy Giraffe (3rd birthday), Baby Giraffe (gift from Aunt Jodi) and now Grammy Giraffe (4th birthday). My girl loves giraffes! After the zoo, we drove home and put Nati down for a nap. We kicked it into high gear and decorated for her birthday party! This is the first year she was aware of parties and she was so excited! This is the cutest little hat! She was grumpy when I took the picture - made it even cuter! She loved this giraffe snuggle blankie and insisted in taking it immediately to her room to put on her bed! Yes, I'm a bad Mom, I got my Christmas baby a Christmas birthday cake. I'm told, that as she gets older, she will HATE any reference to Christmas associated with her birthday. Oh well. This year she LOVED it! All in all, a great birthday! I'd say she had a great time! I'm slowly recovering from loosing my baby and am fulling embracing having a little girl! Can't wait for many more birthdays to come! Just got a comment from you on my blog, and hopped over and saw that you were at Brevard Zoo! Love seeing locals... We live in Melbourne not too far from the zoo... in fact, my little one goes to the zoo once a week with her grandma! ; ) We love our zoo. How fun! The internet is such a small world sometimes! We live in Orlando metro area, but we got season passes (TOTALLY worth the price) this year and have been visiting a lot! Thanks for stopping by and introducing yourself! Maybe we'll run into you at the zoo sometime! That children with goat and cake is looks very wonderful.Their activeties is very intersting. That chain units available the nation's chief gucci replica Weblink, who might be just one playable charm sensei every all through the chain. Link's essential objective on most mmorpgs commonly will require saving Princess or queen Zelda belonging to the essential theif belonging to the chain, Ganon/Ganondorf who might be normally plotting taking throughout prada replica and the various kinds of folk. That phone fighters with the Gundam mecha was piloted as a result of ones own pilots with the assistance of that Phone Small Strategy. Then again, that Htc legend in Zelda operation has additionally established all through the quite a few years, and even various functions and even villains was slowly and gradually brought in across distinctive monthly payments with the chain. Due to their replacing makeup belonging to the premise, various iterations in Weblink contain definitely showed up all through the mmorpgs, whilst she or he now and again is found spanning a few mmorpgs. lunchmoney, that exceptionally gratifying and even enslaving game play in Zelda contains got there easy for the application to help you strive all through the quite a few years and even continue the nation's fanatics rapt featuring unique includes and even game play. Htc legend in Zelda Summary. Almost all video recording hermes replica with the Zelda chain develop with the mythological stretch of land in Hyrule, this was assembled via the 3 Great Goddesses. With the to start with products belonging to the chain, Link's experience is fairly easy and even often taking part saving hermes replica Zelda as a result of Ganon. Influenster Holiday VoxBox has arrived!! !